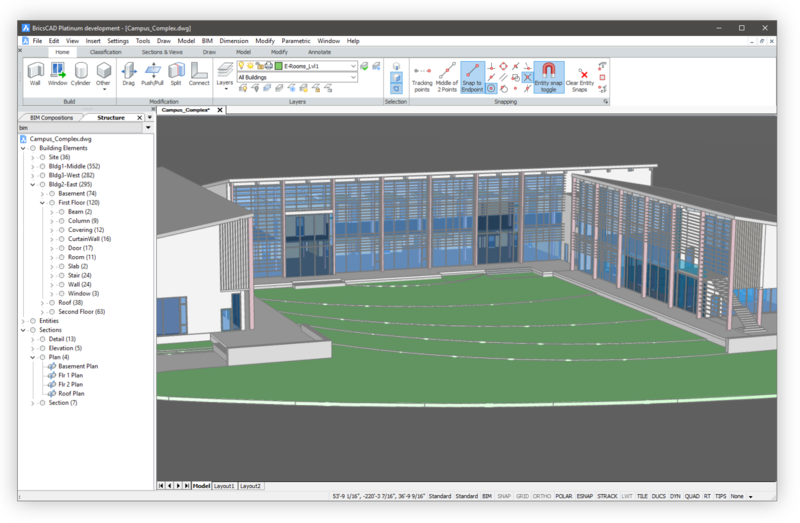 Rhino BIM is an extension of Rhino to use BIM modeling. Rhino have been famous partly because of it’s famous grasshopper plugin to do parametric design. Rhino is relatively cheap the bundled version Rhino + Rhino BIM cost $1295. Ecosystem: Rhino ecosysystem comprise is best know for parametric modeling. The BIM plugin allow to make a bridge between both world. To choose if you want to be compatible with DWG environment, have a less expansive software, and adhere to the simplicity philosophy Brics want to bring. BricsCAD is an economic competitor to Autocad or Revit. It allow to read and write dwg files. It has also developed more recently a dedicated BIM software -Brics BIM- that plug into their main product . Brics focus on simplicity of use and prioritizing the more important features. One of the main advantage of BricCAD is its price, the full suite with BIM plugin cost around 1,580$ and you can start using it from 750$. Brics is integrated to Chapoo online platform. It allow to share you document in DWG format, or explore your BIM model with a IFC viewer. You can also annotate the drawing and define who get access to it. Revit is the more popular BIM software. It belongs to Autodesk since 2002, the leader of the market. Parametric design : Revit is complemented with Dynamo since 2011 that allow to program a geometry with drag and drop handle in a similar way than Grasshoper.